“The Towers of Ilium” is a short film made in collaboration with the local community in Thurrock, in which the history of the area is linked with the roots of western culture in tales of conflict, specifically the “Iliad”. The project was conceived when Lynn MacRitchie took part in the Canakkale Biennale in 2008. Canakkale is situated at the end of the Gallipoli Peninsula, which, as well as its recent history as a battleground during the First World War, is also the fabled site of Troy. The artist decided to make a work in which an iconic structure, a tower, is destroyed by fire, a symbol of how recent history repeats the cycles of ancient conflicts. 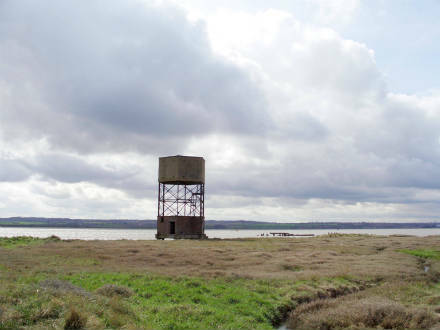 Seeking a location close to London, she was directed to Coalhouse Fort Park, East Tilbury, on the Thames Estuary. Known as a defensive site on the river since the 15th century, the fort was completed in 1874 and in use until 1964. Local stories were combined with passages from the “Iliad” to form the content of the film. The World War Two radar tower in the park became the pattern for a model tower which is carried in procession by a group of “warriors”, a re-imagining of the Tilbury Trojans, a notorious skinhead gang formed in Tilbury in the late 1960s. On a specially prepared site, they take part in a series of stylised fights, a reference to the funeral games with which both the Trojans and the Greeks honoured their dead warriors. The character of Achilles appears, commenting on the futility of such combat, which can have only one outcome - death. A second, large-scale model tower is burned, the spectacular blaze intended to suggest that the real radar tower has been destroyed, the destiny Achilles predicts for all such structures and the societies which rely on them. Must the young, present-day boy who appears at the beginning and the very end of the film also be destined to experience such conflict? Financially supported by Arts Council England and the Tower Supporters Group.